There are a few different approaches you can take when it comes to recording anonymous donations, and each is a valid approach depending on what you want to achieve. We will list the options here in descending order, from most anonymous to least anonymous. If you want to guard the identity of a donor absolutely, the only way to do that is to create a constituent record with a last name of Anonymous and not list any identifiable characteristics in the record. All of your anonymous donations can be attributed to this record, and you’ll never be able to tell from your LGL account who gave anonymous gifts. Note that the only reports that show this ANONYMOUS value are reports where each gift is on its own row of the report. None of the aggregate/sum type reports (and none of the PDF reports) will insert that value. This will treat any gifts donated by that person as anonymous. Note that each gift won't be tagged as 'anonymous' but if you run a gift report and check the box to 'Hide anonymous donor details' then their gifts will be treated as anonymous. If you take this approach, there is nothing anonymous about the donor in your LGL database, so anyone using the database will be able to see who the donor was. It just sets the name as anonymous when running reports. 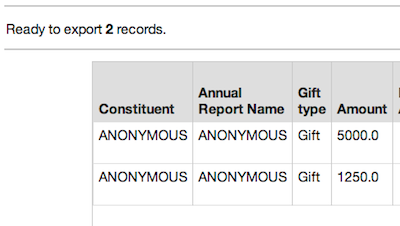 An even less pervasive approach is to mark the donor’s Annual Report Name as Anonymous. This will keep the donor’s name off your honor roll (assuming you use the Annual Report Name for your honor roll), but otherwise everything about the constituent’s record will be the same as a regular donor.